Three of us Aaditya, Ninad & I, we boarded the midnight Passenger train at CST to Lonavala station and Abhash & Tarun joined us at Thane. 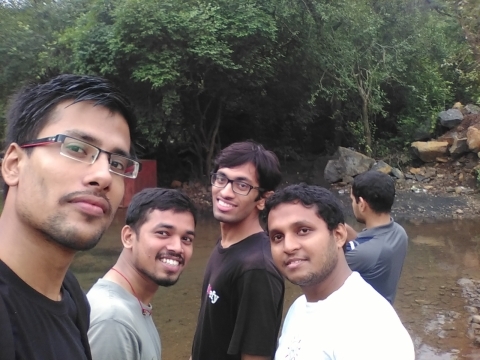 For Aaditya, Abhash & Tarun, it was their first 'Night trek' and even the location was decent- Rajmachi. 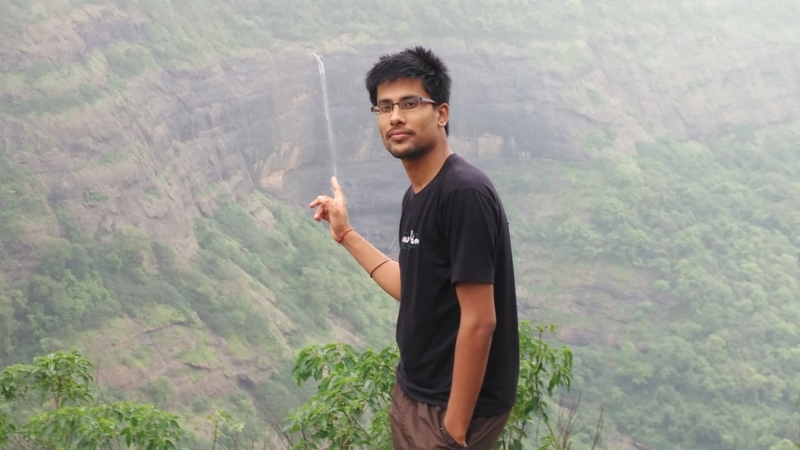 To avoid the boisterous crowd & vehicular traffic at Rajmachi, we decided on a night trek, wherein we could experience the nocturnal beauty of the place of the surrounding flora & fauna. The train entered the platform at 2.10 AM. Our plan was to buy the Maganlal chikki (मगनलाल चिक्की) from the authorized dealer near the ST Bus stand. So with a map in my hand and a torch to show the way, we marched to our destination. The Bus stand was well lit and we could see many people getting ready for trek to nearby locations. It was decided that we walk all the way to Tungarli lake and leave as early as possible and spend the time in the forest patch of the trek. A vada pav (वडा पाव ) and a cutting चहा each, and we were on our way to Tungarli. It was 2.30 AM and the whole town was asleep. Crossing the landmarks- the HDFC bank, Lonavala Gramin Police Station, HDFC training centre etc. etc. etc.. we reached a spot where whole part of the road was dug up. Luckily, a 1ft. narrow and 4 mtr. long plank was put up across the huge pit and we crossed it successfully to reach the other end of the road. The streets were deserted and the only sound was of us chatting. By 3.00 AM we crossed the Pune-Mumbai Express highway, which officially marked the beginning of our trek. The tar road ends here. From Tungarli lake the path is well laid out till Udhewadi village. Somewhere after the farmhouse, a huge Owl swooped past us. Well, there were no street lights and without our LED torch lights, it was pitch dark in there. Except for a few fire-flies which came out and disappeared behind a nearby bush. 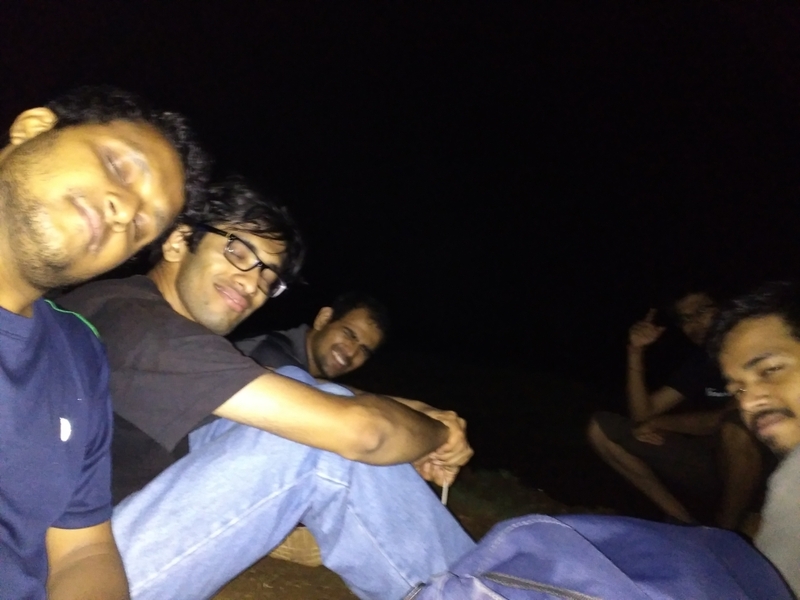 At about 4.00 AM we decided to take a short break. We sat down on the road where the crowd usually gathers up in the day-time for Rappelling etc. activities. There were no signs of rain but the weather was pleasant and the clouds had started accumulating by now. Near the stream. Theres a bridge under construction here. At 5.30 AM, the pre-dawn glow crept across the jungle, peering first through the tangled branches and then inching through the thicket of forests. The late night sounds of cicadas now was filled by the singing of the birds. As planned, we reached the small river by 6.00 AM and got freshened up. A dip in the chilled water was so tempting that we spend a full 20 minutes in the stream. 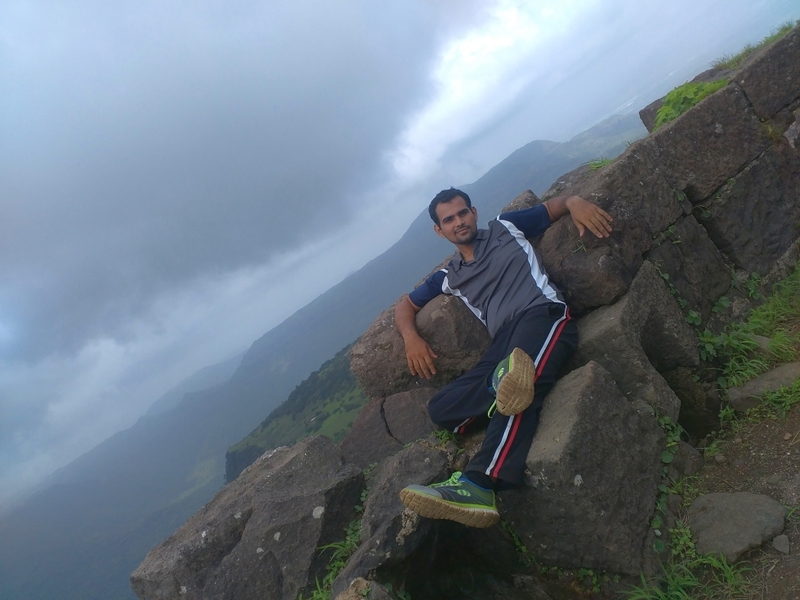 Now fully awake, the next stop was Shreevardhan top. The breakfast of an apple and a (कचोरी) kachori, and we were off again. Abhash Kumar- He can make water come out of his fingers !!! 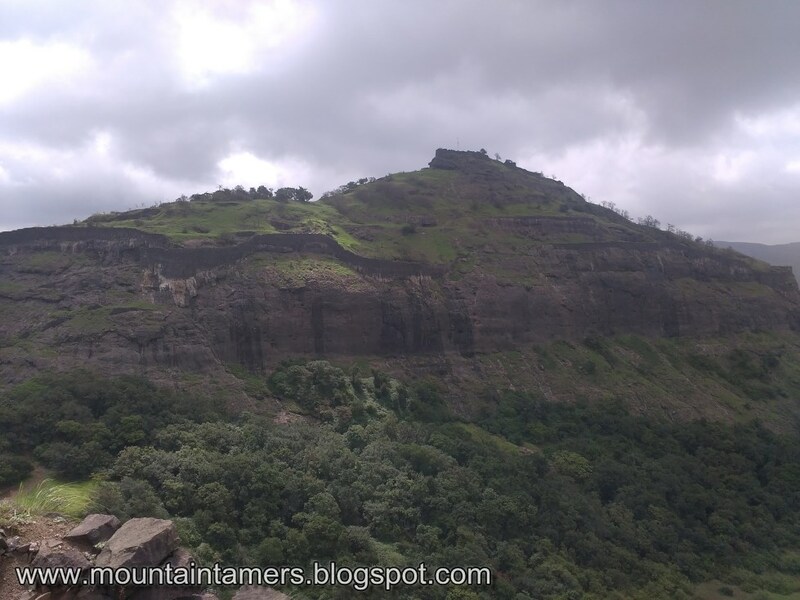 We also crossed the land-mark titled 'Rajmachi border fortification' built and maintained by Maharashtra Tourism, where we can see some existing wall like structure and a temple of Ganesha-Hanuman. 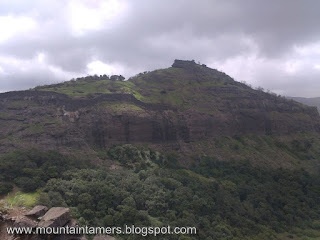 As we approach the Udhewadi village, we can see a series of old caves. A well laid path takes us to the col dividing the two citadels. The temple of Kaal bhairav lies at the col separating the two citadel. 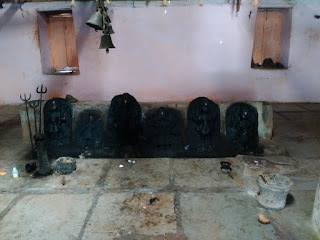 There are many idols in the temple courtyard. A unique piece is an idol of a horse (its unique because it cannot be seen else where on any other forts). 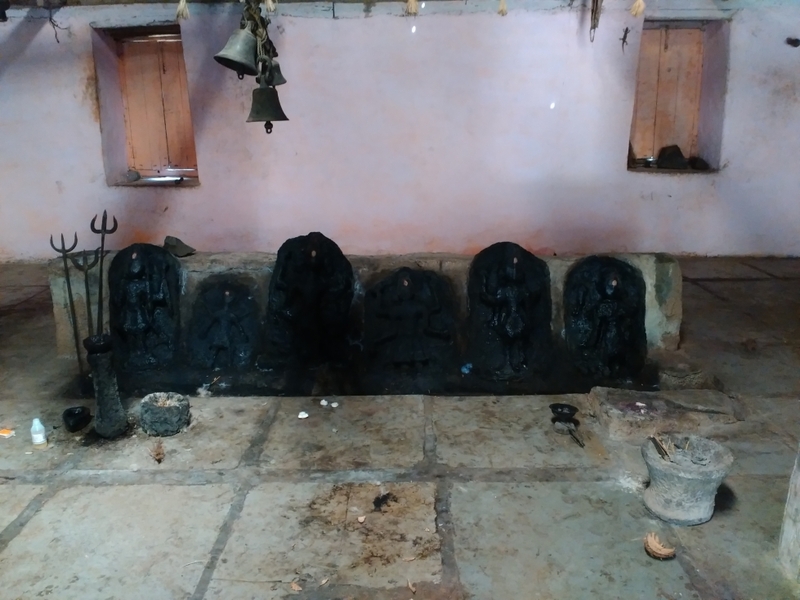 The old dismantled canon, unknown goddess idol, and many carvings are worth noting at the col. The route to the top is well laid before the temple, which climbs up gradually in a zig-zag manner and enters through the main entrance of the fort. The entrance houses some old construction that resembles a corridor. Further beyond, we come across an old rusty canon-like thing and many water cisterns. 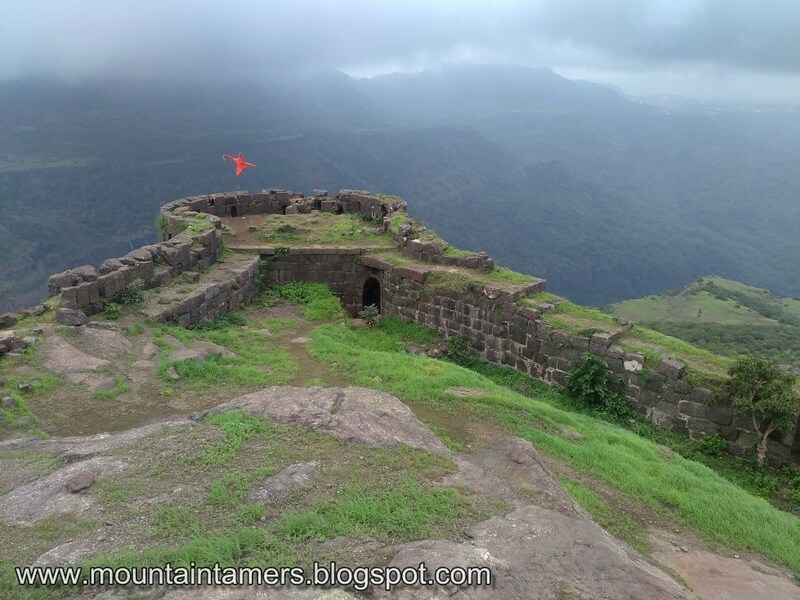 The trail to the top runs along the edges of the citadel hence be careful. Tarun Kaushik- Its my Sofa !! Near the topmost point of the fort, we had a heavy breakfast and then explored the forts bastions. It was cloudy and windy at the same time. We were expecting rains but had to be contented with just the thundering. The fort has lots to explore. The route starts from the left side of the temple (facing the temple). The trail passes through the forest patch and meets another trail from the village. The main entrance of this citadel was still intact. There are many cisterns and remnants of construction on top. 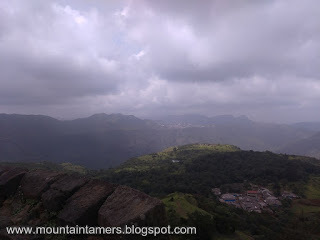 We can also descend directly to the Udhewadi village. 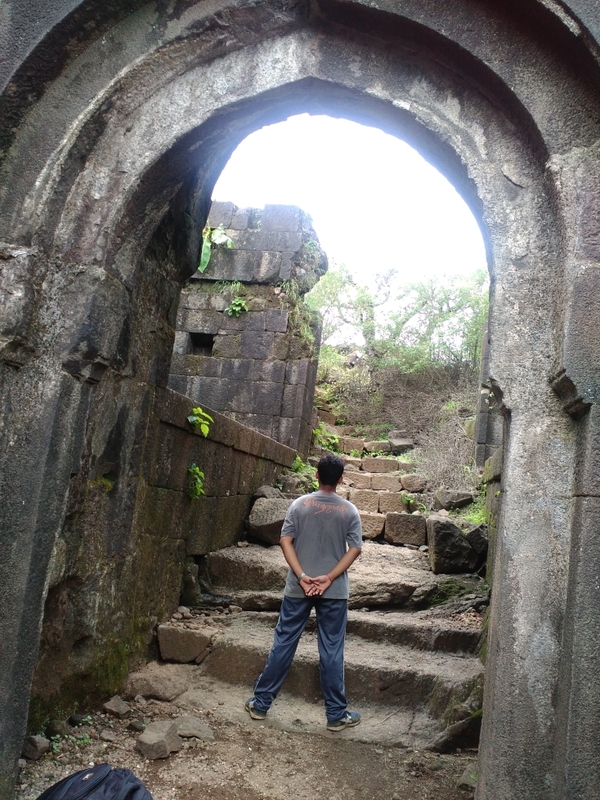 After a quick inquiry at Udhewadi village we started our second part of our journey- descend down to Karjat. We had spared some time for visiting the Buddhist caves (temple) at Kondhane as well. The trail till the col is a straight laid-out path. 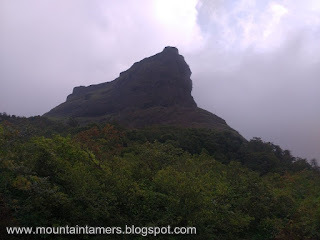 But the later part was a steep descend and the trekkers climbing up from Karjat looked really tired and frustrated. Well, for us, we were less concerned as we had about 8 Ltr. water and enough food supply left with us. It was 2 PM when we reached the Kondhane caves diversion and we could still see people starting their trek to Rajmachi. Many picnic-groups had set-up a camp on a nearby plateau. A traverse from that campling place (about 20 minutes) will take you to the caves. We had a small surprise waiting for us there- a waterfall! Without second thoughts we sat beneath the magnificent waterfall. With all the non-stop walking we had done since the last night it was the most wanted and a most deserving thing for us. At karjat station we downed a jumbo glass of sugarcane juice each and got ready for a long nap- till Dadar station ! !